So once again Bill Tarantino has sent me another year end Reading and Northern signaling update. 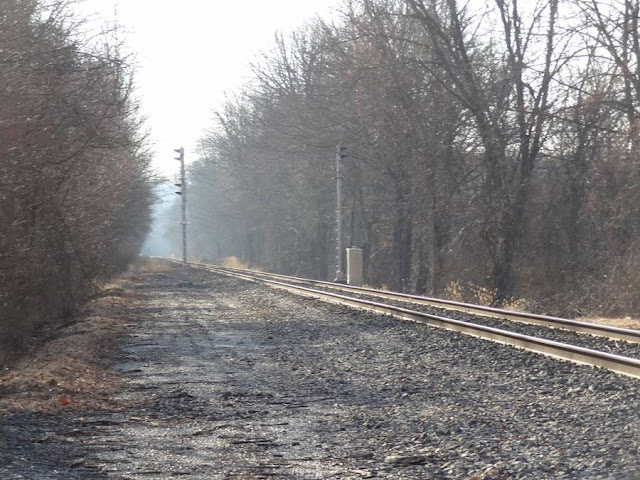 After signaling much of the line north of their operating base at Port Clinton, the R&N is making a real push to open up tourist passenger service to Reading and therefore is looking to extend the CTC along the Reading Division Main Line between North Reading MP 62 and Port Clinton MP 78. Bill has made several exploratory and documentary trips to the area over the course of the last 3 months in conjunction with their fall and winter steam excursions. New signal infrastructure and track work has popped up rapidly like mushrooms overnight. It appears from the accumulated on-site evidence that more work still remains to be done per the final overall design. Evidence indicates probable site of a new interlocking here. New yard track and switch re-alignments completed. Two new sidings under construction on the opposite station platform side for engine holding and run around. Switch circuit controllers on all switches are in place. Old Green & Yellow MBS Station Sign (“N. READING”) has been taken up and moved across the main to the opposite track side across from where it was originally placed. And, now just leans up against a new double door relay box. Probably in advance of new Cabin prep work. No new cabin or signal equipment or up powered switches yet, probably waiting on finalization of new track work here. New single switch Interlocking here. Will control movements into and out of the north side NORTH READING yard. No name plate on the new cabin. Likely called RICK because the old MBS YL Sign at MP 64 says RICK. And, this new interlocking just 0.2 miles to the south will supplant it. Triple head tri-light 3-3-3 absolute home signal for southbound main. Dual head tri-light 3-2 absolute home signal for northbound main. Yard lead siding northbound has conventional 3 light dwarf. MP 63.8 RICK - Ground Level. Looking north towards Port Clinton. MP 63.8 RICK – Overhead shot. Looking north towards Leesport and Port Clinton. Southbound dual head tri-light 3-3 serves as distant approach signal for RICK. 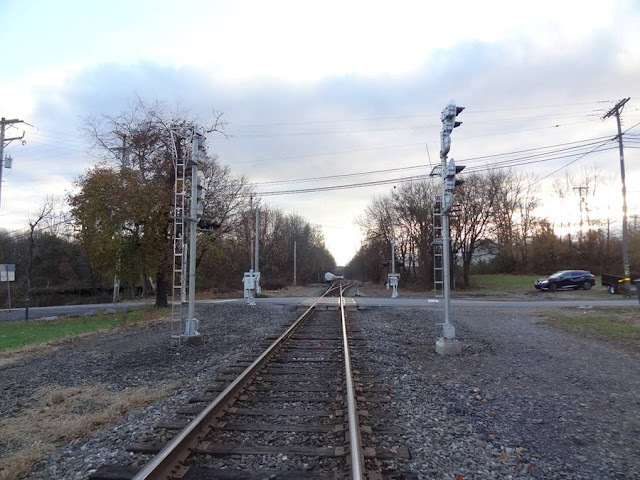 Northbound dual head tri-light 3-3 serves as distant approach signal to MOHRSVILLE for now, perhaps DAUBERVILLE later. This emplacement is equi distant between RICK and DAUBERVILLE. And, could be a telling key indicator of what ultimately happens at DAUBERVILLE. But, presently, there is no new signal equipment at DAUBERVILLE while there is at MOHRSVILLE which is 1.2 miles further to the north. But, MOHRSVILLE is a strange animal now. MP 65.6 DUAL MAST ABS - Looking North, Leesport Grade Crossing is visible in the far distance. Presently, no new signal equipment in place. However, recent white paint lines with arrows and numbers now run across the grade crossing blacktop foretelling future cabling activity. Logical site for a new interlocking connecting the other end of the MOHRSVILLE sidings. Track work on the 1.1 mile new siding from MOHRSVILLE was stopped cold here quite some time ago right before the creek bridge about 100 yards north of the grade crossing. Suspect creek bridge fixes or replacement is the impediment issue here which may take some time to resolve. 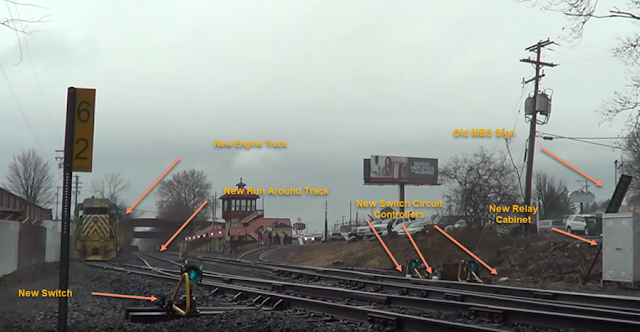 Additional new track work would be needed here including a 75 yard long track siding extension over the bridge to or beyond the grade crossing, integration of a powered interfacing switch to the main and grade crossing equipment clearance modifications. It’s wait and see for now. 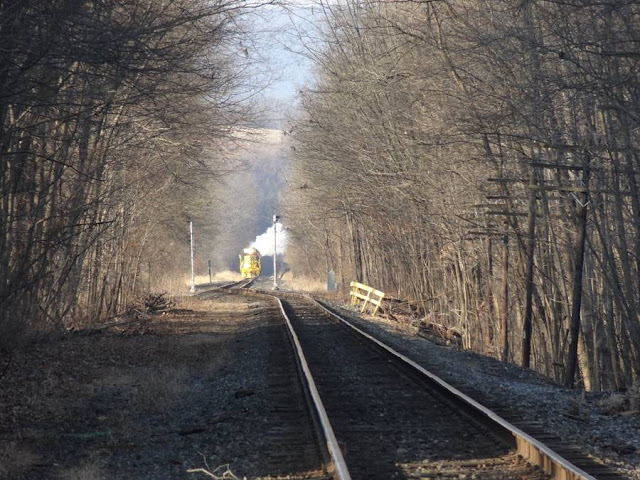 MP 67.4 DAUBERVILLE – Probable passing siding Integration from MOHRSVILLE 1.2 miles to the north is pending. 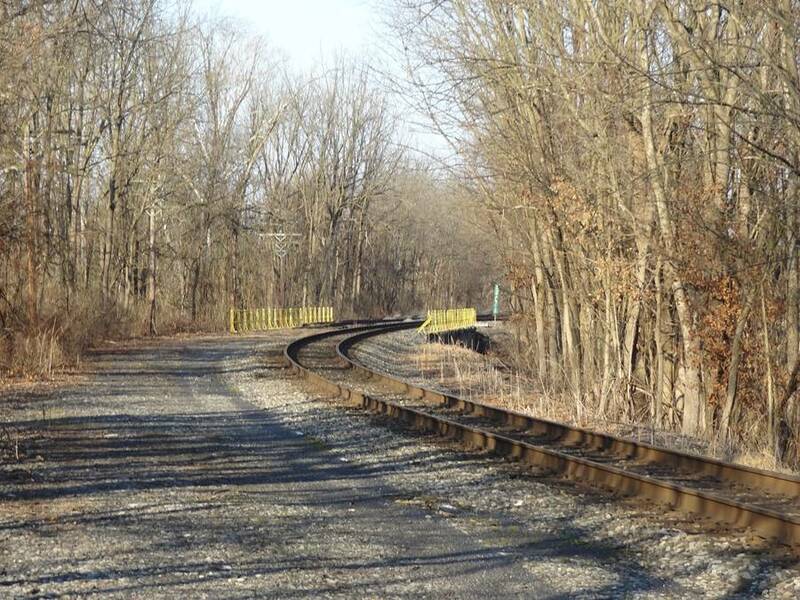 Likely MOW bridge issue then new track work needed before switch and signaling work. Apparently, this will start out as a switchless controlled point for both traffic directions. However, evidence to the contrary comes as an extruding power cable is clearly visible near the main siding switch along the main. And, paint markings are visible for a power line to be run to the secondary main siding switch further up the main as well. Lack of new northbound signal equipment beyond the foul points on all siding tracks within logical interlocking bounds also remains puzzling. 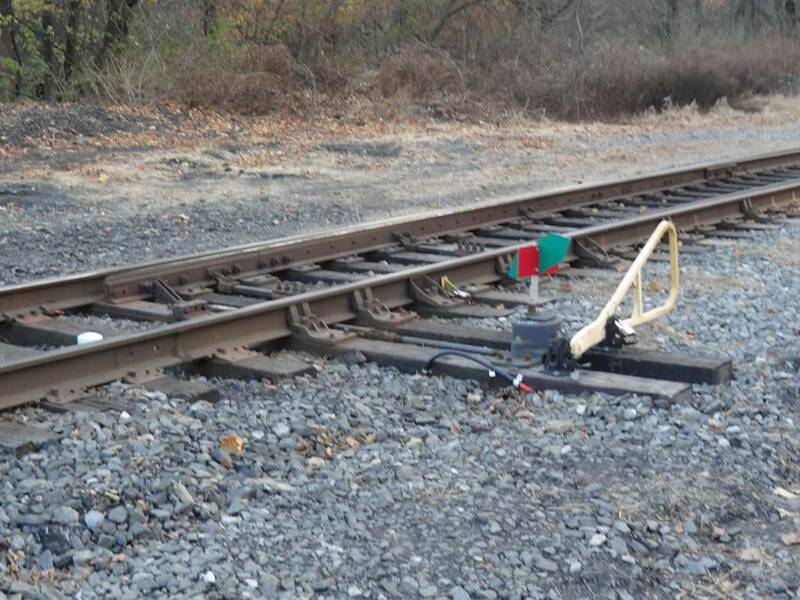 Controlled point design may be temporary pending DAUBERVILLE track work and siding interface or the switches may remain hand operated with electric locks. Signals, Cabin, Relay Boxes and Switch Circuit Controllers are in place here. Adjacent set of dual twin head tri light 3-3 masts for both directions. Southbound twin head mast is clearly an absolute home signal regardless of powered switches or not. Northbound twin head mast presently must be a paired home signal serving in a controlled point capacity because the next northbound signal is a single head ABS unit and therefore it is clearly not serving as a numbered distant approach signal opposite an absolute home signal. MP 68.6 MOHRSVILLE – Main Southbound Switch showing possible evidence of an electric switch lock. 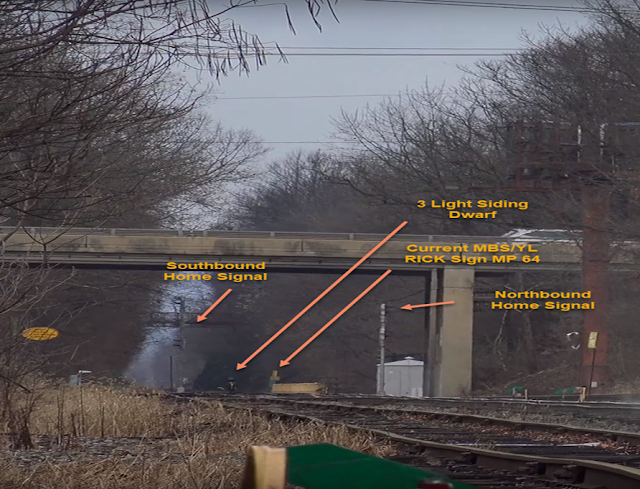 MP 68.6 MOHRSVILLE – Dual absolute CP signals to potentially support short turn excursion trains with a non-interlocked siding. 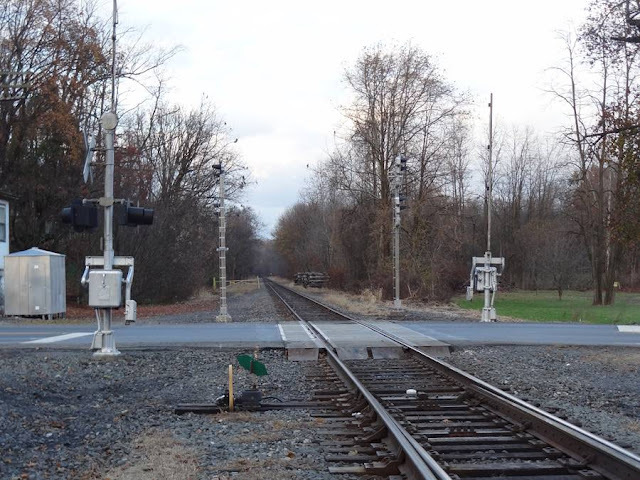 MP 68.6 MOHRSVILLE – Absolute holdout signals looking south towards the pair of sidings that might need signal protection for working local freight trains or short turning excursion trains. 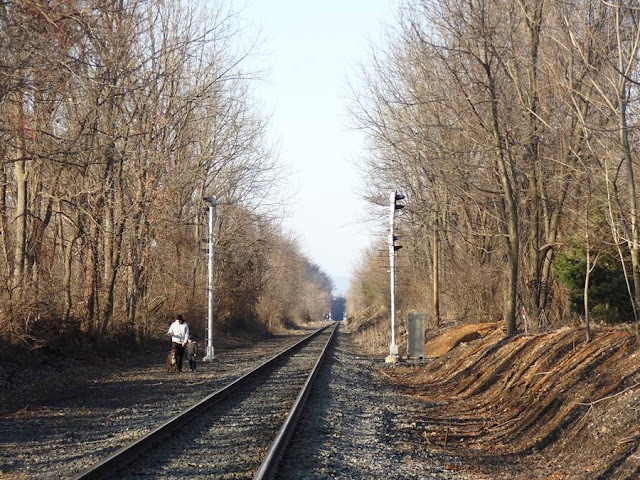 Southbound dual head tri-light 3-3 serves as distant signal for MOHRSVILLE. Northbound single head tri-light serves as normal intermediate ABS. MP 71.4 – DUAL MAST ABS. Location not easily accessible. Looking north. Southbound single head tri-light serves as normal intermediate ABS. Northbound dual head tri-light 3-3 serves as distant signal for WEST HAMBURG. MP 73.3 -DUAL MAST ABS - Looking south. Presently, only one new single triple head mast configuration without heads emplaced. Lack of paired mast southbound, and, previous northbound dual head approach ABS, foretells that this will be a new northbound home signal likely governing a new powered switch off the main. And, a new 1 mile long siding extension here. New switch and supporting track work and southbound absolute home signaling required to complete. MP 75.8 WEST HAMBURG – Northbound single mast triple head installation in place. Foretells a new interlocking here. Currently, the site of a northbound manual switch on the main for PORT CLIINTON HQ track 2 siding. Logical integration point for new 1 mile siding extension up from WEST HAMBURG. Would replace MBS/YL KERNS as a train control point. Potential additional interlocking here depending on WEST HAMBURG design and development. Currently, only a single powered switch is operational among an array of other manual yard switches. 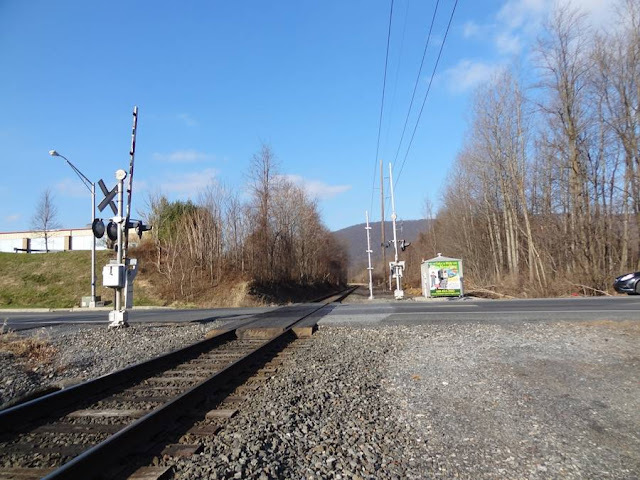 This powered switch controls main line routing split between POTTSVILLE and TAMAQUA. Presently, has no governing operational signals and no new signals or signal equipment to date. The powered switch is still controlled from inside Port Clinton HQ Tower by the R&N Dispatcher. Twin old black girder signal bridges are still in place bounding the old PORT CLINTON interlocking. The old bridges still could serve as a basis for new signal infrastructure. Switch circuit controllers are in place for all switches here. 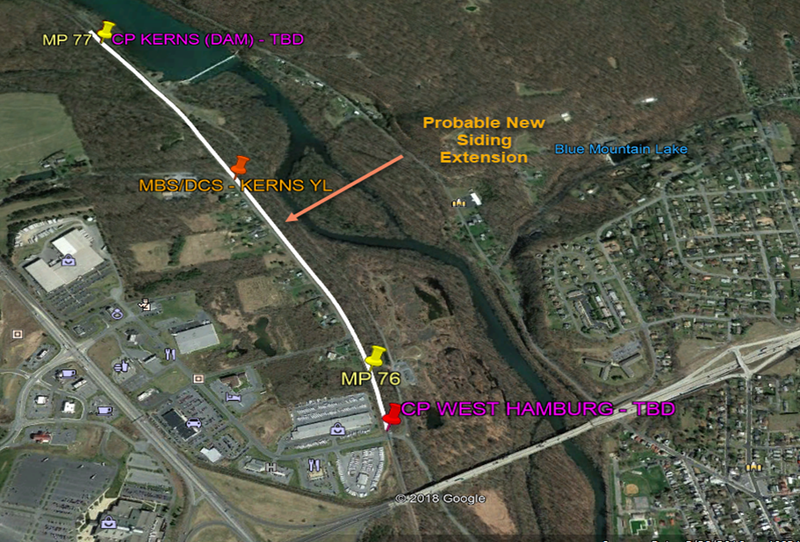 Wait and see what happens here with WEST HAMBURG, KERNS and CLINT in play as well as the old bridge infrastructure. Likely to become another new interlocking with dispatching and operations headed for NORTH READING Tower. For some additional thoughts on the topic it appears as the R&N has run out of historic signal equipment and is simply purchasing Safetran clamshells off the shelf in a Southern Pacific style target configuration. 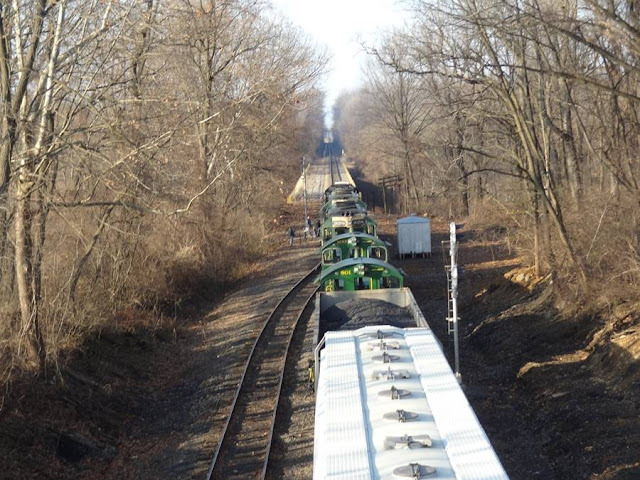 Real shale considering a number of vintage Reading signals were made available from the recent NS resignaling programme on the Reading Line. If dispatching operations are to move from Port Clinton to North Reading it will be interested to see if this is a full time situation or just when tourist trains are operating as control could easily be retained in both "towers". All and all this is great news. With the PTC mandate sterilizing much of the nation's signaling infrastructure it will be "historic" just to see some plain old CTC.